Ever wanted an iPhone with a physical keyboard? 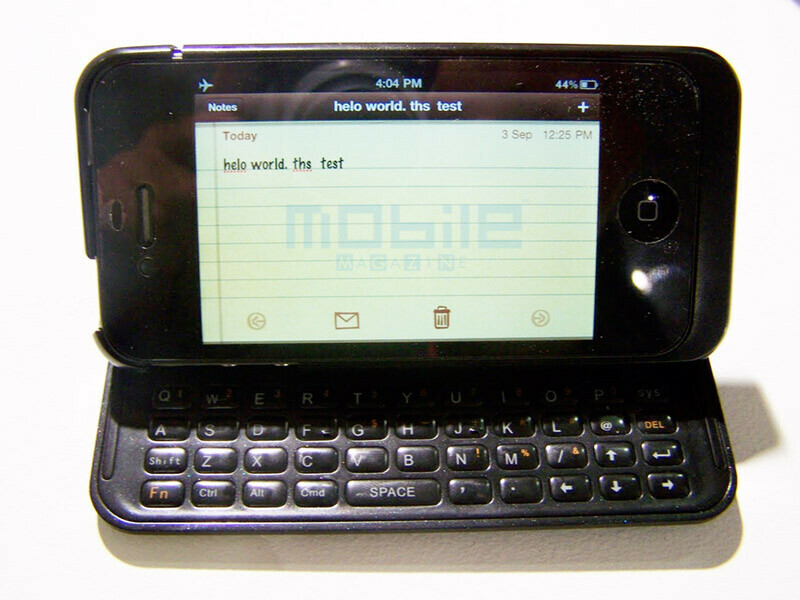 Nuu, the Hong-Kong accessory company, will be selling a $69 iPhone 4 case that adds a QWERTY slide-out keyboard to the thin handset, and uses the whole phone as a tilting screen. It is a pretty good implementation from what we are seeing in the pictures, with elevated letters on a chiclet-style keyboard, complete with its own battery for the backlighting. It should enhance typing speeds quite a bit, compared to the touchscreen keyboard for people who miss the good ol' tactile feedback ever since they got their first iPhone. No word yet on how much will this case weigh, but at least now you can be watching movies on your iPhone 4 and shouting "Look, Ma, no hands!". I might buy one of these, shave off the plastic that encases the Iphone, then attach the back structure that supports the keyboard onto a Dell Streak battery cover. If my estimated measurements are right it would be great for attaching it to the Streak. By the way this qwerty keyboard uses bluetooth, it doesn't work through the Iphones plug in port. Phonearena just kinda forgot to mention that. Thats bad. Battery will go down faster than you can type this sentence on that keyboard. Oops, forgot about how fast it drains with bluetooth on, thanks. it says that it has its own battery. i would say that since it does have its own battery, the battery life of the iphone 4 will only be impacted as much as if it were to have a bluetooth headset connected. That's actually pretty badass in my opinion.. if I could get one for my X I probably would just to have for occasional use. very cool love it .. i got one this morning and am currently usingit to type this.. the best invention ever homies !!! !